Affect vs. Effect: What’s the Difference? Home » Affect vs. Effect: What’s the Difference? Out of all the confusing words in English, affect vs. effect are amongst the most puzzling. Many people have trouble telling them apart because of their similar spelling and pronunciation, but, once you know their differences, they are actually quite easy to tell apart. Today, I want to go over the differences between these two words and give you a few ways to remember their differences. This game will affect our standings in the league. The argument affected their marriage deeply. After giving the patient the preliminary dosage, he described his affect as flat. This is a technical term for which there is no need in everyday language. There is very little chance that this usage would ever make it into your writing, unless you happen to be studying psychology. The AP Stylebook gives some great advice on using “affect” as a noun: avoid it if possible. Unless you must use “affect” as a noun, i.e., you are a psychiatrist, you should try to avoid it. It leads to too much unnecessary confusion. See a similar discussion with the word adjective affective here. The politician misrepresented the effect of his policies. Over my tenure, I effected many changes around the company. Tax cut proponents hope to effect economic growth. 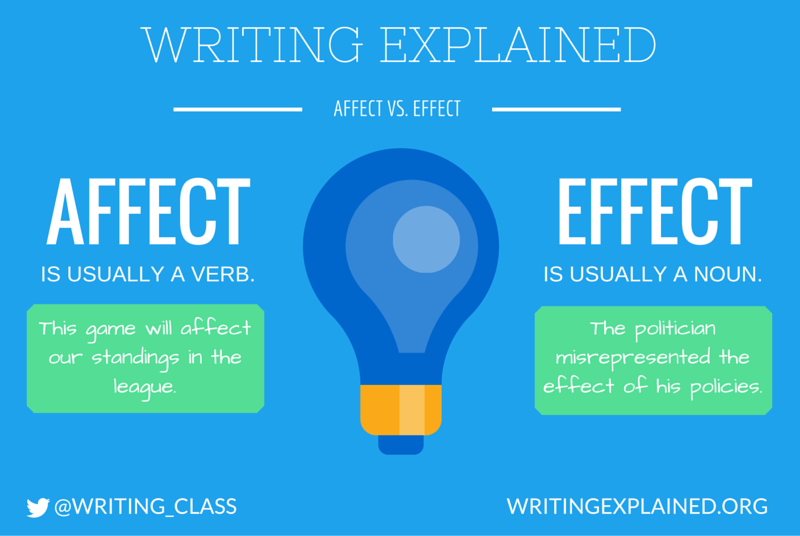 “Effect” as a verb is not as common as “effect” as a noun, but it is still quite common, so you should be familiar with it. 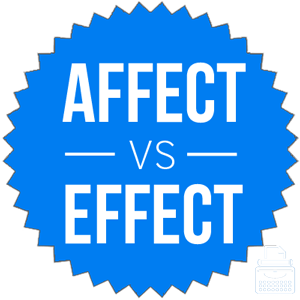 There are a few good effect vs. affect examples to remember the difference between these words that will get you through almost all the time. First, determine if the usage calls for a noun or verb. Second, if the sentence calls for a verb, the word you want is almost always “affect,” meaning to influence or alter. The sunshine _______ my mood. The sunshine affects my mood. Third, if the sentence calls for a noun, the word you want is almost always “effect,” meaning outcome or result. The ______ of studying is getting better grades. The effect of studying is getting better grades. You can usually tell if a noun is needed by whether or not an article precedes it, such as “a,” “an,” and “the.” In our above sentence, “the” precedes “effect,” signaling that a noun is necessary. Remember that both of these words can function as nouns and verbs, so this trick is not foolproof. There will be some cases where you cannot simply say, “affect is a verb and effect is a noun.” But this trick will get you by most of the time. Is it affect or effect? Of course, that depends on your intended meaning. Affect and effect can both be used as either nouns or verbs. Affect is almost always a verb, and using it as a noun should be avoided. Effect is almost always a noun and is sometimes used as a verb. 1 What is the Difference Between Affect and Effect? Toward vs. Towards: What’s the Difference?